CSK, chasing 152, needed 18 to win in the final over and Ben Stokes was handed the responsibility by his captain Ajinkya Rahane to defend the runs. What turned out became one of the most memorable and controversial moments in Indian Premier League’s history. He did right – bowled outside off and Yorker. But Jadeja was ready for it. He was standing near his off-stump, all prepared to swing his bat but Stokes went wider and Jadeja swung anyway and in the process slipped but connected the shot sending the ball high over the bowler’s head for a six. Jadeja also completed 100 wickets in IPL and said he’s happy with the way the season is turning out to be. “Feeling very good. I am very confident right now as I am enjoying my bowling, batting and fielding as well. End of the day I’m contributing something for my team,” he said. 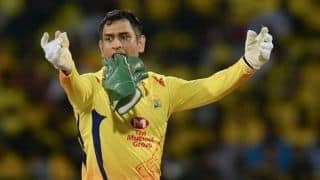 A drama ensued midway through the over when a no-ball decision was immediately overturned by the on-field umpires resulting in CSK captain Dhoni walking back onto the field expressing his displeasure. When the match resumed, CSK needed 6 off two deliveries. Santner took a couple off the penultimate delivery before Stokes delivered. The equation was not three off one. A slower delivery followed and Santner sent it high into the night-sky for a booming six as CSK overhauled the target.